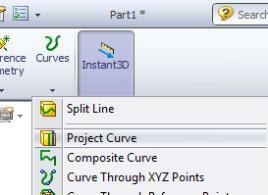 Do you know how to create a 3D curve in SolidWorks? In SolidWorks, there are many ways for us to create a 3D curve. 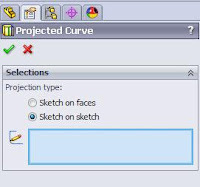 There are Project Curve, 3D Sketch and Intersection Curve. Here I’m going to show you how to use this 3 feature to create a 3D curve. First of all, all 3 features have the similarity to create a 3D curve. It use the standard 3 views as a guide. Choose 2 planes and sketch a curve in each plane. 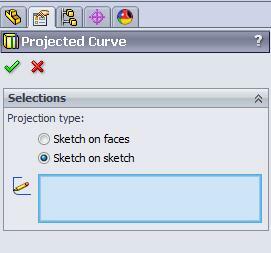 then select "project curve" feature, which drop under curves. Select "sketch on sketch" in the property manager. Then select the 2 sketches and click OK. What you get next is a blue colour 3D curve. This blue colour 3D curve cannot edit directly. What you can do is edit the 2 original sketch. Do give a try. Next week I shall share with you all on the 2nd method. siapa itu SWGeek? jackson? anyway...good sharing...kambate! whew!! !